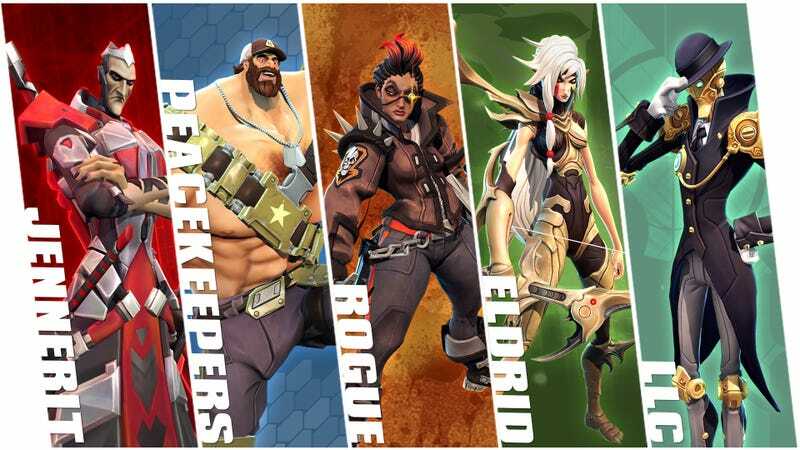 I really love Battleborn and it has a pretty good array of unique heroes. Problem is, after beating the prologue the game unlocks...6 or 7 of them, the one you played in the prologue not being one of them oddly. Thankfully, to date, the heroes are not unlockable using real money, but rather by completing specific challenges. I’ve put together a roadmap for how to go about unlocking the entire roster. Step 1. Beat the prologue! Just by beating the prologue you unlock a descent roster of heroes. Role: Sniper. A very annoying sniper. God I hate Marquis. Don’t play Marquis because you will make me sad when you just sit in the alcove on overgrowth sniping me forever while Caldarius blinds me in a hilarious bit of teamwork on your team and I jump around fruitlessly getting blown up by marquis. Heroes Unlocked: Caldarius, Shane and Aurox, Reyna, Ghalt, Deande, Kleese, Melka, Bolder, ISIC. General Strategy: Play through the story on advanced with an online team and score silver or better on each mission. Medals are awarded based on total score so try to open every crate you can as they frequently have bonus score. Some missions, users report, scale very poorly (the archive and the saboteur) with more people and are easier to get a higher score with less people. Guide: Simply beat the first story mission solo or with a group. ISIC is your reward after Kleese re-appropriates him :D.
Guide: Caldarius is unlocked after beating the second mission (The Renegade) on any difficulty. You must finish the mission in order to have him join the Battleborn. Guide: Shayne and Aurox are unlocked automatically after playing 5 co-op missions with at least one other player. Just play the coop missions with randos until they unlock. Guide: Beat the story mission “The Experiment” on any difficulty. Guide: Beat the Story mission The Heliophage on any difficulty. Guide: Reyna should unlock automatically while playing through the Co Op missions. You need to have command rank 8 which you should reach for sure while playing. Guide: Finish the mission The Heliophage on Advanced difficulty. You only have to finish the mission, not get a certain ranking. The best way to do this is to use Gallilea and Helix her such that you max her health regen and sword damage (taking it’s Dangerous to Go Alone mainly). Focus on running to the map markers and not worrying about in between enemies. I was able to finish the first section (the timed section) with double digit time to spare. For the boss marathon, just stick close to the center of the middle platform and do your damndest not to get knocked off. Gallilea high level is very difficult to kill PvE and the fact that Rendain is such a pushover damage wise helps a lot. Focus on taking out the enemies on the platform when they spawn instead of Rendain as they’ll hurt a lot more than he will. Guide: Beat every mission on normal difficulty with a silver ranking. Again, remember to get every crate you can find to help boost your score and grab those shiny yellows that drop from bosses. The hardest one I’ve found so far is The Archive as there are very few bosses overall. It’s vitally important on that mission to get EVERY box and spore you see. Guide: Earn Silver on every Advanced story mission. Keep in mind that as you add more players the game scales up the difficulty exponentially. If you don’t have a pre made team this could be a very difficult task. Your best bet if you do public is to pick Miko or Reyna and try to keep everyone alive. Most pub games PvE NO ONE picks healing of any sort. Ever. Basically for the rest of the heroes, just play the game. Most will unlock on their own as you play but specifics and a rough order of how you will probably unlock them will be listed below. Note that bot matches DO count towards progress on hero unlocks so you never have to play against RoughSexualScrub69 in order to unlock Gallilea or any other hero. These are probably the easiest heroes to get right out the gate. These heroes can be unlocked by simply playing five matches of any game mode as a hero from a certain faction. The easiest way to do this is online capture matches. These tend to last 10-15 minutes each. I’ve provided each hero’s faction underneath their portrait. Guide: Defeat 800 minions and Attikus is yours. This is easily accomplished on Incursion maps to supplement whatever you achieved through story mode. Guide: Kill 800 Jennerit minions. She really hates the jennerit. Also she’s awesome. PS. Best Hero. Guide: To unlock Whiskey Foxtrot simply win 15 matches. It might take a little bit of playtime, but it’s not difficult. Again, capture vs. bots is your best bet here. I find bots in the Incursion maps tend to glitch most games and will end up standing perfectly still in a corridor somewhere. Guide: To unlock Phoebe Elizabeth Audelia Hemsworth IV get 50 kills total from any match. Note this does not have to be in a single match (although getting 25 kills in a single match will unlock the title “Worthy Of Song” but is cumulative. Obviously on Story mode you won’t progress this. Here you’re better off with incursion maps as they tend to go longer and thus give you more time to become beastly and wipe their whole team. Added to this, the AI glitches frequently which means you have more opportunity to get the kill rather than a bot stealing it and you getting the assist. In order to get the final hero out so far (Pembles isn’t out as of this writing), you must spend 45,000 credits. It’s a lot of credits and something that you won’t accomplish any time soon (you can’t purchase credits, you MUST earn them through playing. I’ve found capture maps give less credits than winning an incursion and story maps seem to get a solid 600 or so per run but they take a long time. I’ll update this list as more heroes come out (and add images and more information about hero roles as time permits). I’d say your best strategy is to try out every hero at least once or twice until you find one you love. I am partial to Galilea in case you couldn’t tell because she’s amazing and versatile. You’re reading TAY, Kotaku’s community-run blog. TAY is written for and by Kotaku readers like you. We write about games, art, culture and everything in between. Want to write with us? Check out our tutorial here and join in. Follow us on Twitter@KoTAYku and Like Us on Facebook.